If you look at the record books after South Boston’s season opening “Spring Shootout 150” Late Model Stock race, you may not see the full story. 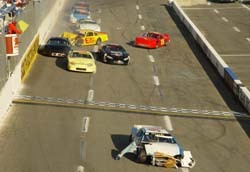 Yes, there were 26 Late Models. No there weren’t any lead changes. Add a few crashes and a repeat race winner to the list. Sounds kind of like a non-story? Not really. Underneath it all there was much more to Peyton Sellers’ dominant win at South Boston Speedway on Saturday. It was more than the fact that it was Sellers’ second-straight “Spring Shootout” win. 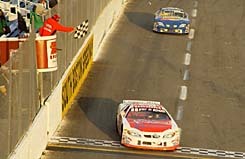 The race itself may have been a turning point in Late Model Stock racing in general. A new carburetor has breathed life into the Late Model Stock division. It made for an exciting race although on paper it did not appear that way. Sellers was the man all day at SoBo. He used the bigger carburetor to his advantage and stole the pole in qualifying. Then he led wire-to-wirefor the big opening day win. Speaking of pressure, Sellers had very little en route to his Spring Shootout win. But boy was the racing behind him intense. Bailey’s "buddies" Brandon Butler and Frank Deiny Jr. put on a show behind Sellers that gave the Danville driver enough breathing room to make his win pretty easy. Neither Butler nor Deiny had anything for Sellers but that may have been due to the fact that they spent most of the race sliding around with each other. Butler looked to have Deiny disposed of early. From there it was Deiny’s #4 and Woody Howard’s #99 that thrilled the fans with a great duel. Deiny won that war. 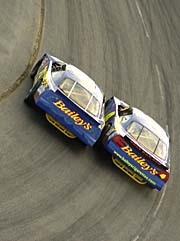 But by races end Butler and Deiny were at it again. Butler’s #29 fought off Frank’s tenacious charge to hold on to second place. “Me and Brandon have had some classic battles here,” said Deiny after finishing third. “I got down there and I thought man I’ve got him and it’s done. But it was real loose down there especially coming across the paint (inside of turn 2). I got next to him and we raced as hard as we could. 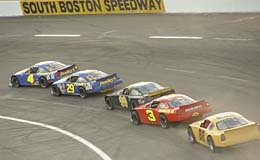 Trading paint and hard racing is something that is common at Short Tracks like South Boston on a weekly basis. But for these Late Model Stock warriors, they have a new weapon that makes their racers much more potent. A larger carburetor, which will be run at South Boston Speedway and Motor Mile (VA), created more power under the hood and a made for a bunch of happy drivers after the race. The Two Bailey's cars (#4 Deiny outside, #29 Butler - outisde) put on a side by show not once, but twice during the Spring Shootout 150. 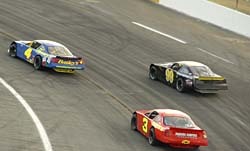 Late Model Stock racing has often been criticized for being lackluster because of the lack of power and the car’s reliance of momentum. But now those claims may be a thing of the past. The Late Model Stocks were slidin' around all day. can save tires for 20 laps and run hard for 20 laps. That is what racing is all about and that is what the Cup guys do every single weekend and if you are going to move up you have to be good at it. 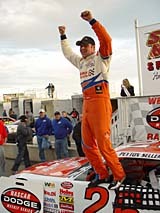 “Late Model racing used to kind of remind me of restrictor-plate racing. What you had at the beginning was what you had and it wasn’t going to change or fade. Now you can wear your car out and it can fade. Ford they gain a lot more than a Chevrolet,” says Deiny. “I don’t really think that his car was good today, I think he was off. The motor was what got him where he was (up-in the high groove) and if they would equal us out in motor I don’t think he would be able to get up there like that. “I never really drove a Dodge with a 350 on it so I can’t really tell a difference there,” said Howard who was running his first race in the #99. “I’ve got a ton of motor now though. I think I’ve got as good a racecar as anybody has. Deiny was very happy with the new carburetor, but was quick to point out that the new piece may work to the advantages of the Dodge and Ford powerplants. Deiny had to fight off one of those fast Dodge’s during the Spring Shootout. Woody Howard had the famed #99 Dean Motorsports Dodge hooked up on the top-side of the race track and looked as if he was the one of the fastest cars before mechanical woes knocked him out of the race. Woody Howard (#99) used his power to go to the top-side of the track while battling Frank Deiny, Jr.
Peyton Sellers believes the increase in power may have caused some of the early race wrecks at the Spring Shootout. Like it or not, the new carburetors are here to stay and the Late Model Stock brand of racing may be getting a facelift because of it. But for the drivers it will take a little getting used to. Although the stats will say Peyton Sellers ran away with the Spring Shootout, the fans that bought tickets at South Boston knew they saw something completely different. They may not have been able to see it, but that is because it was hidden under the hood.